Stafford's rigid clamp-style shaft adapters now come in a wide variety of configurations to connect dissimilar shaft sizes and types. Stafford Shaft Adapters can be manufactured from aluminum, steel, and stainless steel. Providing a host of solutions, these adapters are offered in step-up and step-down configurations with or without keyways and shaft extensions. 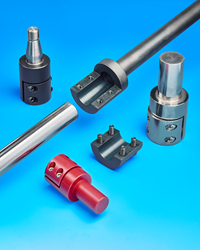 A line of rigid clamp-style shaft adapters that come in a wide variety of configurations to connect dissimilar shaft sizes and types is available from Stafford Manufacturing Corp. of Wilmington, Massachusetts. Stafford Shaft Adapters are rigid couplings with a clamp-type female end that fits securely over an output shaft and feature male ends which can be supplied in various lengths and ends to solve shaft compatibility issues. Providing a host of solutions, these adapters are offered in step-up and step-down configurations with or without keyways and shaft extensions can be round, square, hex, D, threaded, keyed, tapered, and machinable. Manufactured from aluminum, steel, and stainless steel, Stafford Shaft Adapters come in bore sizes ranging from 1/2” to 1-1/4” I.D. and provide a secure transition without sacrificing torsional holding power. Suitable for OEM and MRO applications, they are non-marring, designed for use on hardened shafts, and can be customized to user requirements.